The remaining $300 million will be used for projects selected by NOAA and Department of the Interior. "This milestone agreement will allow us to jump-start restoration projects that will bring Gulf Coast marshes, wetlands, and wildlife habitat back to health after the damage they suffered as a result of the Deepwater Horizon spill," said Secretary of the Interior Ken Salazar. 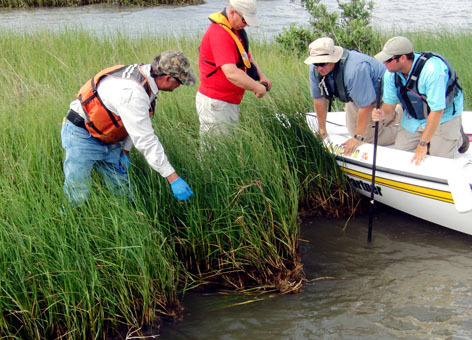 During what has been deemed the largest oil spill in U.S. history, NOAA's Office of Response and Restoration provided forecasts of oil movements, advised the U.S. Coast Guard on cleanup operations, produced and maintained the Common Operational Picture, and managed large volumes of data streams and assessed resources threatened by spilled oil. We continue to work with state and federal agencies to document impacts to the Gulf of Mexico’s natural resources and the public’s lost use of them.